Wanna feel like a million bucks? Wear the cufflinks of the wealthiest House of Westeros! 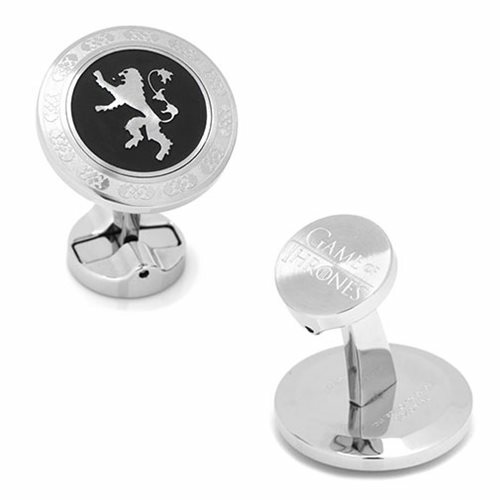 These stainless steel cufflinks feature the lion sigil of House Lannister. They're a must for fans of the HBO series Game of Thrones! Wearing the cufflinks of the wealthiest House of Westeros will have you feeling like a million bucks. The Game of Thrones Lannister Filigree Stainless Steel Cufflinks feature the lion sigil of House Lannister raised over a matte black enamel background. These cufflinks are a must for fans of the hit HBO series Game of Thrones. They measure about 3/4-inch in diameter.